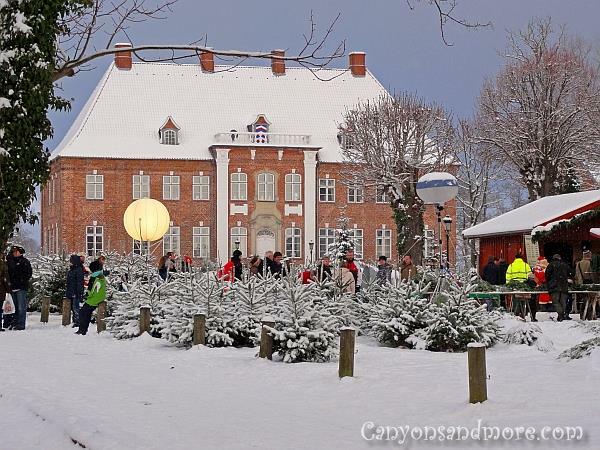 Schleswig-Holstein is the northernmost state of Germany and each town and city holds an annual Christmas market. The smaller towns usually last a weekend but are also worth seeing because of their country charm. Church and charity groups often sell handmade crafts and the feeling is somehow more quaint. The larger city markets last throughout the whole month of December, usually starting around the first Advent and ending either just before Christmas or until the first of January. The images on this page feature the markets located at Husum, Kiel, Dobersdorf, Neumünster and Stockseehof. 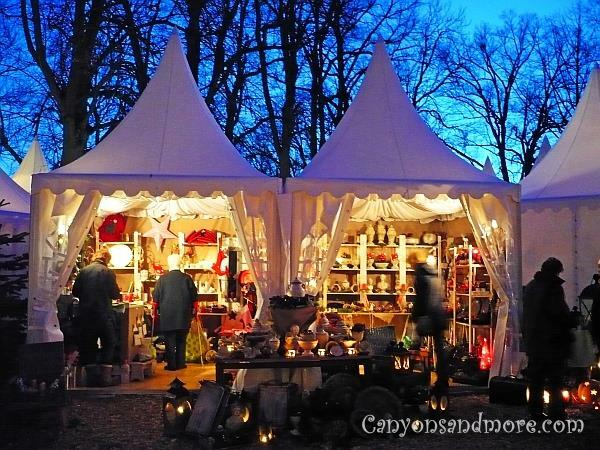 More markets of Schleswig-Holstein can be found on separate pages: Lübeck Christmas Market, Eutin Castle Christmas Market, Pronstorf Christmas Market and Traventhal Advent and Christmas Market . 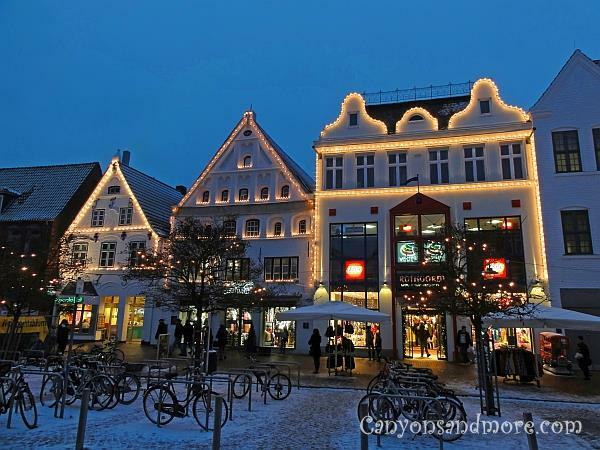 In the image above you see the lovely and festively decorated town of Husum. Most of all the shops in town decorate their facades with white lights, which is typical in this country. The white lights look very elegant and festive. At the same time they make the shops look more inviting to visit and do some Christmas shopping. Husum is located on the North Sea and is especially worth visiting. First of all, the location on the water gives it a special flair. If you park across the water and cross the bridge to enter the city, you already get a great glimpse of the lights of the buildings across the water with Christmas trees lined up along the pier. The walk towards town is also pretty with the colorfully lit houses. Once you enter the market square, that is the location of the actual Christmas market. 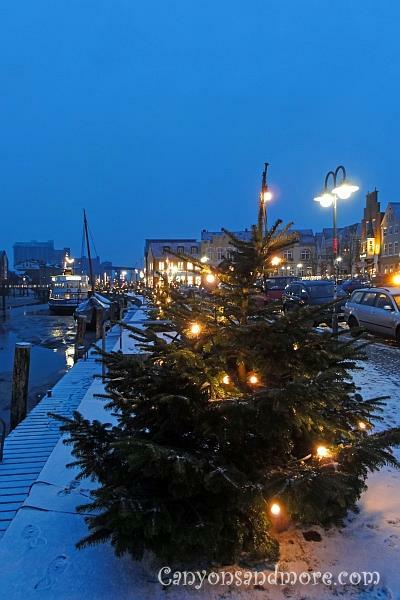 From there you can walk all over Husum and enjoy the attractive decorations of the buildings. 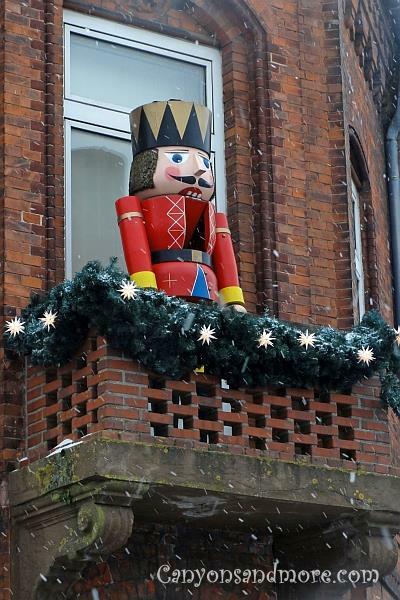 This handsome nutcracker can be found on the outside of “Das Weihnachtshaus” which is a museum in Husum, Germany dedicated to the theme of Christmas. The collection includes anything that has to do with Christmas from the last 200 years including tree decorations, toys, wooden pyramids, advent calendars, figures and ornaments made out of wood, glass and metal and baking forms for marzipan. The entrance fee as of 2012 was 2.50 Euros for an adult and the museum is on three levels. There is also a guided tour offered (in German) that will explain the details of the exibitions but it is also possible to just look for yourself. Kiel is the capitol city of Schleswig-Holstein and is located on a bay of the Baltic Sea and has a harbour. Tourists, especially from the Scandinavian countries arrive per ship to see the city all year round. 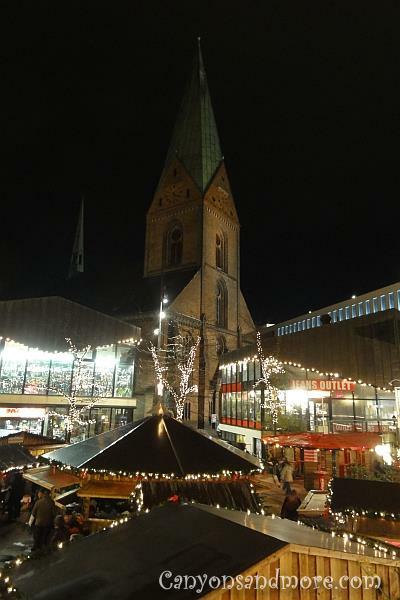 The Christmas market in Kiel extends from the Sofienhof (a shopping mall in the city), down the Holstenstrasse (the main shopping street of the city) and ends at the square in the above image at the St.-Nikolai Kirche (Church). While at the market during Christmas of 2013, many of the trees in the city were lit with thousands of white lights. This looked so amazing and added a great festive touch to the city. Like most Christmas markets, you will find plenty of unique decorations and gift ideas at the wooden booths. The Christmas markets are also a great way to meet up with friends to eat a bite and have a drink of mulled wine to warm you up. This was at one of the stalls at the Christmas market in Kiel. These glass candle holders have been popular at Christmas markets through the years. They glow of brilliant colors when the tea light is placed into the votive. 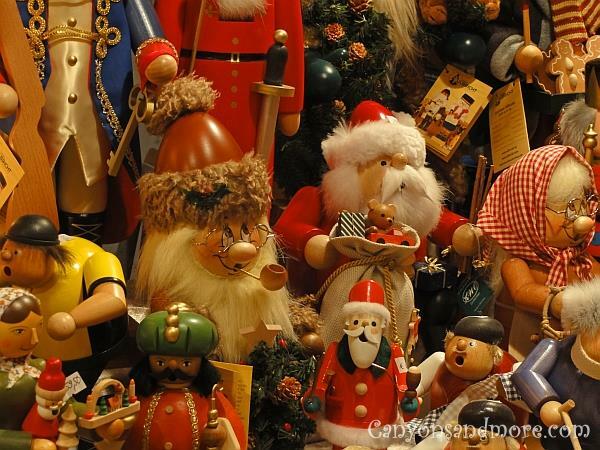 The image was made at a stall at the Christmas market in Kiel selling tradtional items such as wooden decorations and nutcrackers. This is the Christmas market of Flensburg. It has a quite small Christmas market which extends from the Südermarkt to the Nordermarkt. The wooden pyramid is a highlight and underneath it is a stand where you can try out mulled wine specialties. The area around the pyramid mostly has eating stands and rides for the kids. If you happen to be in Flensburg during the holidays, a special tip would be to take a walk to the “Rote Strasse”. This area contains a few narrow side streets which are charmingly decorated for Christmas and have many small specialty stores and boutiques. 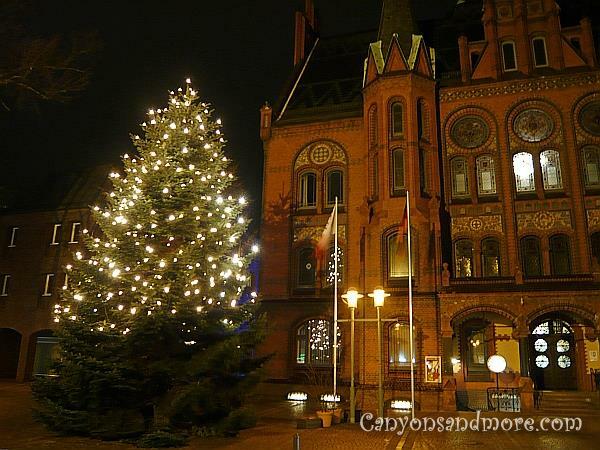 The town hall in Neumünster looks magestic all year round but at Christmas, an especially large tree decorates the front of the building in style. 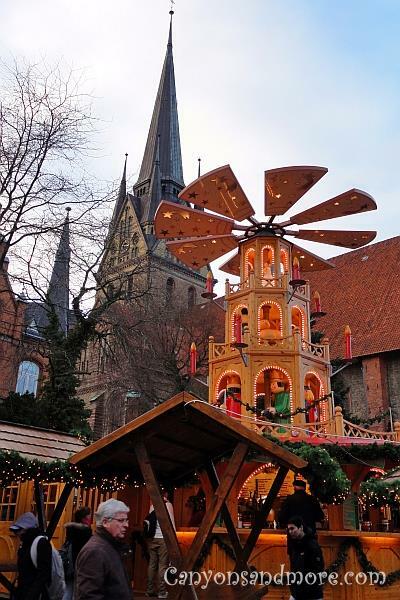 The market at Neumünster is not like most other German Christmas markets you can visit. There are not many stands selling gifts but instead the market does have a lot of stands selling grilled food to eat and drinks. It is more of a market to go eat, drink and enjoy the atmosphere. For kids, though, it is fun to visit the market in Neumünster. There is an ice-skating rink close to the market so the kids can have their fun while the parents are meeting up with friends over a cup of mulled wine and catching up on the latest news. Dobersdorf is a small town in Schleswig-Holstein, Germany. The market itself is located at a farm and is very quaint with lots of hand made goodies and culinary dishes and Glühwein (mulled wine) to keep you warm during your visit. There is the main market outside but you can also go to the indoor market, too. Many estates in north Germany, for example Stockseehof (in this image) near Kiel, hold attractive markets as well that may last up to two weeks. Along with the tents that are outdoors you can also go inside the barn where you will also find booths and tables selling wares. At night any of the markets are especially worth seeing when the lights are on. 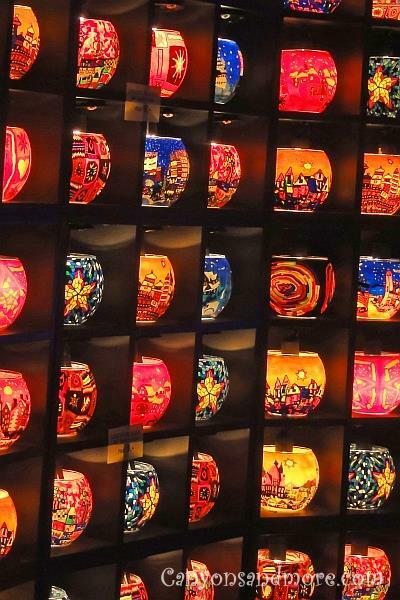 Candles and lanterns also give the markets a warm and inviting glow. While walking through the markets, traditional German Christmas songs and international Christmas music fill the air. The temperature is cold and the flavour of hot Glühwein (hot mulled wine) will fill your nose and quickly warm you up inside. The market stalls sell not only commercial gift items and ornaments, but also wooden items and handcrafted items, too.